Deborah Levy’s short book of short stories is pitched at a relatively high key but a deeper note of sadness underpins it. Her characters are splendidly individual but share a sense of having strayed from home, or of not having a home, or of wondering what it might be like to have a home. 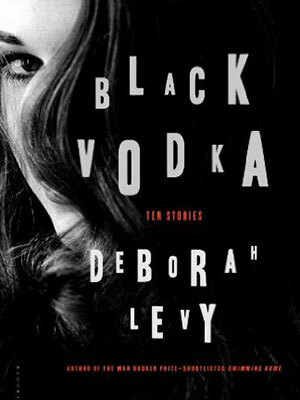 In “Black Vodka,” the first and title story, a writer of advertisements at “a leading agency” refers to himself as “the crippled poet,” but that does not stop him from sleeping with a colleague’s girlfriend. Or maybe he feels being “crippled” entitles him? Sleeping with friends’ girlfriends might be how he takes revenge on men whose spines are not misaligned, men whose backs lack humps. It is he who gives the name “black vodka” to a flavored drink to be marketed in formerly Communist countries where noir is trending. Kelly Cherry‘s new poetry book is Quartet for J. Robert Oppenheimer. Her book of flash fiction titled Temporium is now available.